LiteratureDutch literature, poetry, translated literature, English, German, and French literature, and secundary literature. ArtVisual art, architecture, typography, artist’s books, original art works, theatre, cinema, photography, and music. ArchivaliaManuscripts, photos, posters, invitations, and ephemera. PeriodicalsLiterary periodicals and art periodicals of the 20th century. VinylSpoken word and literary experiments on vinyl. Willem Frederik Hermans / Freddy de Vree. weverbergh. (halverwege jaren zestig) ‘Readymade’ look-alike portret van Weverbergh, met getypt onderschrift ‘weverbergh’. Afbeelding van Göring die gretig de Hitlergroet uitwisselt met zijn Führer. 27:21 cm. 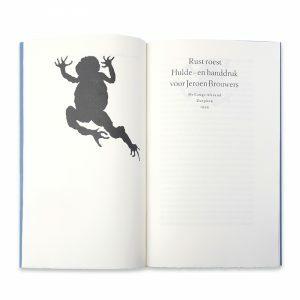 -Doorslag van een getypte brief van Freddy de Vree aan Willem Frederik Hermans. “antw 27 v 65”. 2p. 27,5:21,5 cm. Over Blokker, Lubberhuizen, Weverbergh, Themerson en Paul de Vree. -Handgeschreven ansichtkaart (grafmonument Da Costa) van Hermans aan De Vree. Genua 28 sept ’65. 10,5:15 cm. 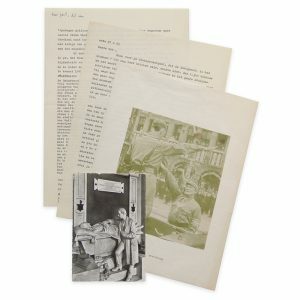 Purchase and sale of books and literary archives. Open Monday through Saturday from 10:30 until 18:30 & every first Sunday of the month.